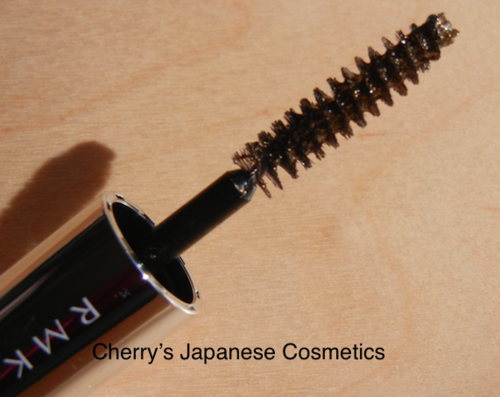 Let me (Cherry) share with you my review of RMK’s Lip Crayon & Mascara from RMK Holiday Makeup Kit (2013). Of course there are no perfume in both of them. The Lip Crayon included in the RMK kit is full size. The color is a sweet, soft pink with a lot of silver glitters. 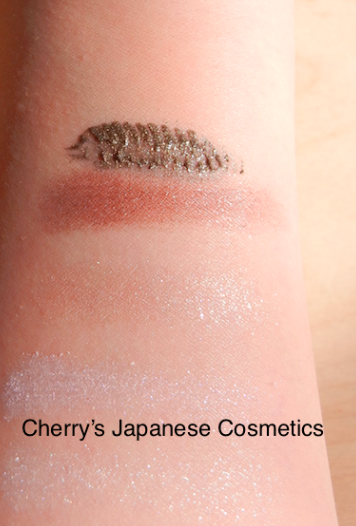 In the photograph, the glitters are not easy to see, but when I first saw this Lip Crayon I was shocked because the glitters looked big and thick. However, when I tested this Lip Crayon, I was delighted that the glitters were not as obvious on my skin. 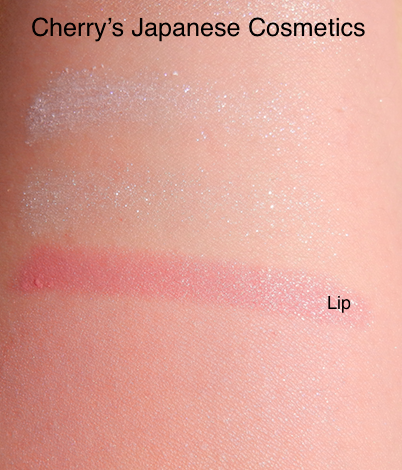 The glitters are actually tiny and gave my lips an elegant sparkle and delicate pink color. In the picture, the Lip Crayon swatch is on the third line. The first two lines are eye shadows from the RMK Palette. The bottom line is a swatch of the blush in the RMK Palette. About ten years ago, I used to be wearing RMK’s Gloss Crayon. 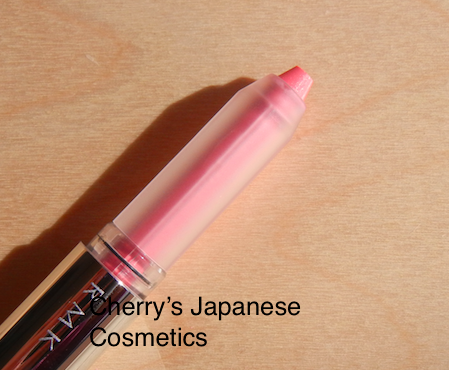 The color was fun but the formula was different; it was very drying and even made my lips peel. Ouch! I’m a little older now, so my lips are a bit drier than before, but this formula of RMK’s Lip Crayon is better. I tested the product with and without lip primers, and it does not dry out my lips! It’s feels great to wear this Lip Crayon. Doesn’t this mascara look brown in the picture? The color actually is black and it loaded with gold glitters. More glitters! My lashes must be black, so this product is not for me. One of my friends saw the RMK Mascara and said, “How cool!” She loves all the golden bits, so it’s fun mascara for right person. In the picture you see the RMK Mascara as the first line. The four color swatches below the mascara are from the RMK Holiday Palette. The RMK Holiday Makeup Kit 2013 includes shimmering and glimmering products that are the perfect way to dazzle this holiday season! If you wanna have those RMK Limited products, please visit here often: “Limited & Seasonal“. Please check the colors, he latest price, and order RMK Lip Crayon, the regular type from here; “RMK“.